Brian Chapman will be continuing his soccer career, as he signed his national letter of intent with Union College, May 7 at Grant County High School. 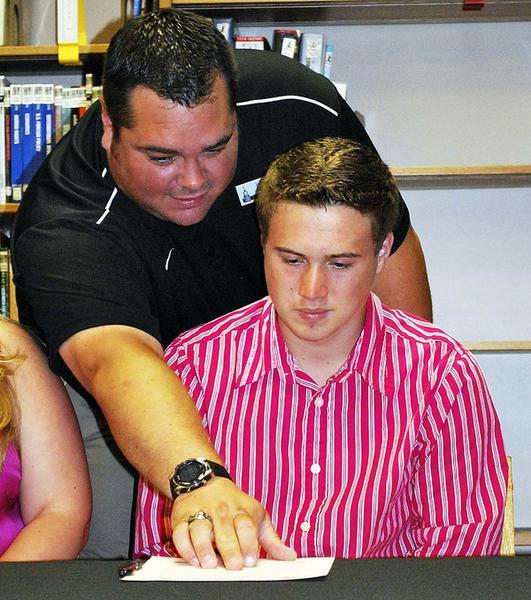 Brian Chapman is shown where to sign his name to become a Union College soccer player. The senior, who played for the GCHS soccer program for four years and at the middle school for three years, will now be a part of a Union team that managed to go 10-7-2 in 2011. “Coach Tyler Brock has helped me all the way through this decision and I am anxious to get started,” Chapman said. Chapman said he plans to pursue a degree to become a registered nurse and that helped factor in the decision to choose Union. “It was between the University of the Cumberlands and Union College,” Chapman said. Chapman had originally picked Asbury University as his choice to play collegiate soccer, but received word that they had too many recruits coming in. With his choice, Chapman can relax and enjoy the final weeks of his senior year. GCHS boys’ soccer coach David Schmitt, who coached Chapman in middle school and at the high school level, was excited to see Chapman get the opportunity to play collegiate soccer. Schmitt said Chapman is going to be good contributor and is proud to have had the opportunity to coach him all these years. Chapman thanks his parents, Janet and Tim, for helping him throughout his soccer days.